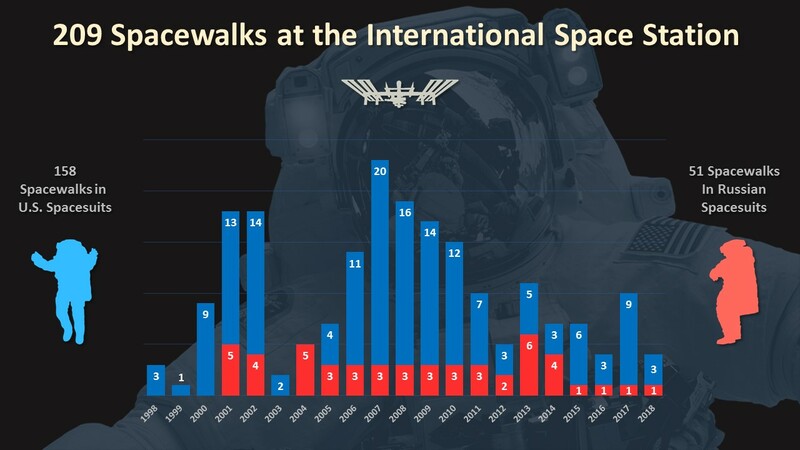 There have been 209 spacewalks at the International Space Station since December 1998. Expedition 55 Flight Engineers Drew Feustel and Ricky Arnold of NASA completed the fourth spacewalk this year at 3:43 p.m. EDT, lasting 6 hours, 10 minutes. The two astronauts installed wireless communications antennas on the Tranquility module, replaced a camera system on the port truss and removed suspect hoses from a cooling system. Spacewalkers have now spent a total of 54 days and 10 hours working outside the station in support of assembly and maintenance of the orbiting laboratory.